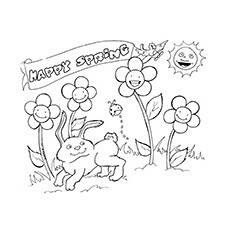 Blooming flowers, bright sun, chirping birds, happy rabbit and buzzing bees at work – this picture is more than perfect to tell your kid what spring really stands for. Assist your kid in learning how to spell the word ‘spring’. 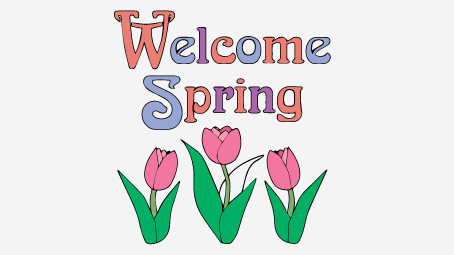 Let us welcome spring with all our heart. 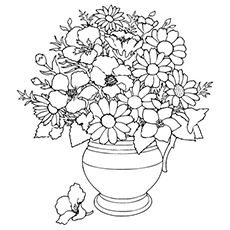 This picture can be a good option for your kid to learn coloring simple flowers. It is apt for toddlers. 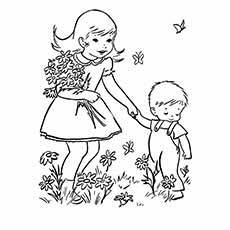 While your child colors, you can tell him that we often use flowers to welcome others, similarly, Mother Nature too blooms her flowers to welcome spring. 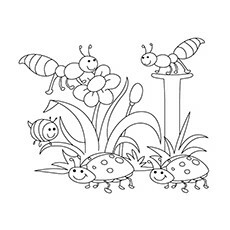 The small beetles, flowers and cute little animated bees make the picture attractive for your kid to color. 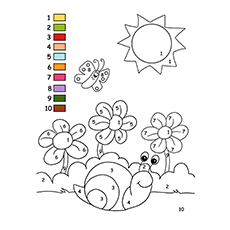 The broad outlines make it easier for young kids to color. Bees are enormously important for human’s survival. Take this picture as a chance to explain the entire concept of food chain with pollination and bees’ crucial role in it. 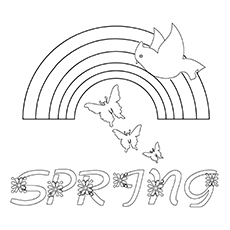 Remind your kid about his preschool rhyme talking about spring and rainbow. As your kid colors the rainbow, flower and sun, you can talk more about the seven colors of rainbow. 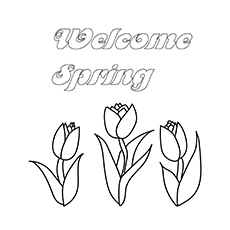 This image can be a great way to showcase many spring activities at the same time. 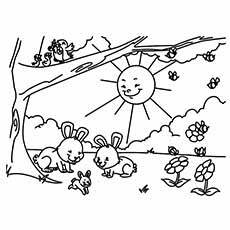 The picture has young kids, farm animals, birds, blossoming tree flowers and sun. 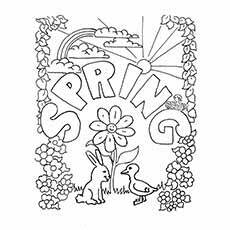 All these make this an excellent and easy way to understand spring activities. It can help your kid learn to color multi-objects at the same time, opening up their imagination. 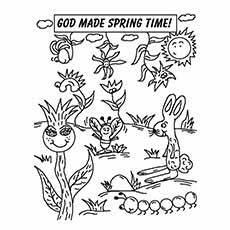 Use this picture to explain how nature works and how God is the one who made spring. 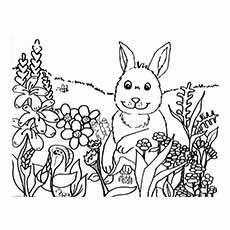 Your kid might need assistance in coloring few elements of this picture. Treat this as a great bonding activity. If your kid loves ducks, this one might excite him. 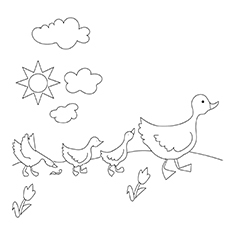 This cute picture with ducks, makes for a good coloring option. The bright sunny day, blossoming flowers and ducks walking in a row is sure to appeal your kid’s creative side. This next picture is ideal for all Donald Duck lovers. The baby Donald Duck looks really cute to catch your kid’s attention. The happiness of baby Donald’s is sure to make your kid smile. 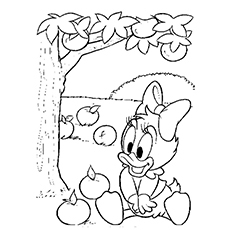 Be prepared, you might have to feed him an apple after your kid color this page. Spring is picnic time and kids love spring picnics. This picture purely depicts the fun and frolic associated with spring picnic. 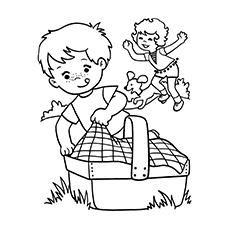 It shows the boy curious to know what is in the basket and the girl playing with the dog. Human figures can be little tricky while coloring, assist him when required. The final picture is apt to end the session. 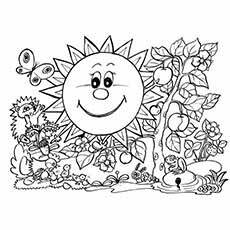 This picture will help your kid color multi-objects at the same time. This picture will be nothing short of an adventure. 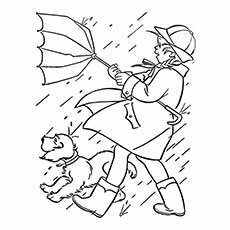 He needs to color the picture as per instruction. The ‘color-the-number’ concept always works wonders for kids. 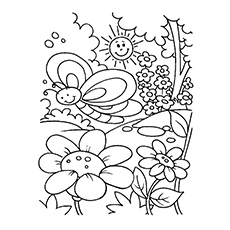 This coloring page is the best way to introduce your child to different flowers of the season. 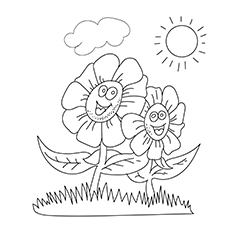 Ask your child to color each flower in a different hue and watch him or her delight in the activity! 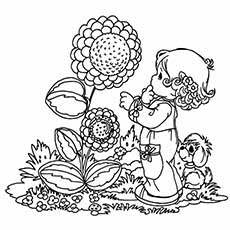 Set them on the task to gather all the information about the flower that they can. It is a great way to learn things for your child! 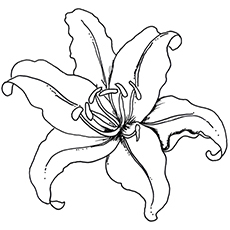 This page features a lily. It is one of the most commonly seen flowers in spring. 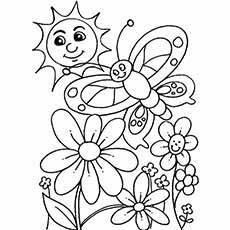 Point out the right colors for the flower before your child starts coloring. This page is sure to pique the interest of your kids. 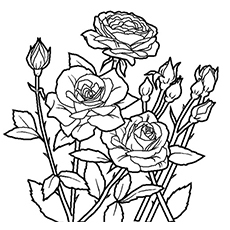 Allow them to gain interest in the topic of flowers! 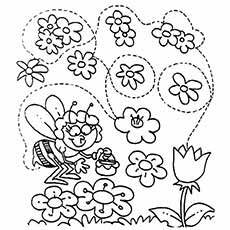 This coloring page shows a bee trying to find nectar in the flowers. 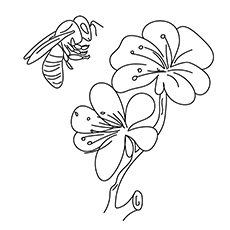 You can use it to teach your child about how the flowers sustain the bees and honey is collected by the bees from the flowers during springtime. 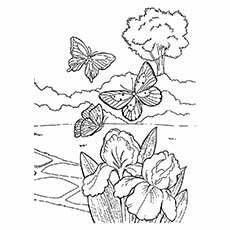 Make coloring this page an exercise in color combinations. 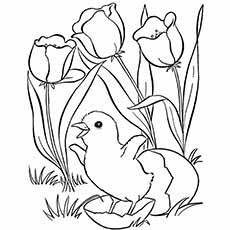 You can teach your child to color the flowers with different colors that look good when combined. 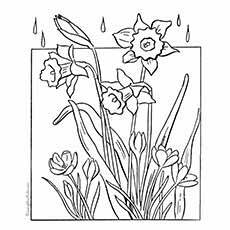 Since spring is dominated by different flowers in different colors, this coloring page is appropriate for the theme. Let your kid use all the favorite colors here. 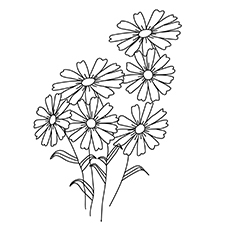 Daisies are beautiful spring time flowers. 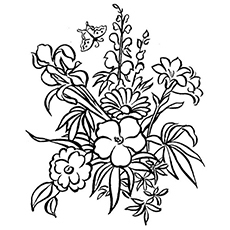 This coloring page has daisies for your kid to color. 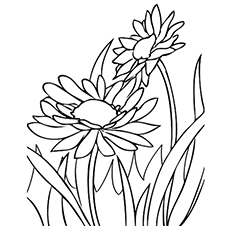 Show your child a real daisy before letting him color the page so that he can get the colors right and also learn a lot about the flower. This single tulip signifies the spring season. 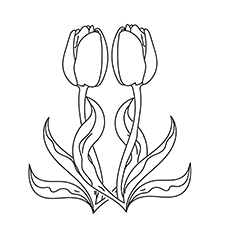 It is a bulbous flower and tulips are very pretty in bunch. 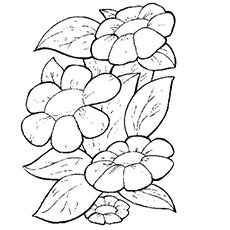 Your kid will love to color this flower and learn facts about it as well. 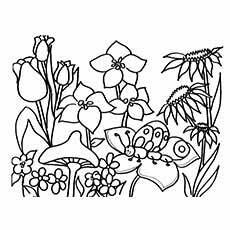 You can use these to teach about different spring flowers.